Last week, I got into a bit of a heated discussion with an admin on the facebook Vegonews page. They had shared a graph, attributed to the website www.diseaseproof.com (though I’ve been unable to find it there), which I think is clearly designed to suggest a causative relationship where the data simply does not show one. Graph attributed to diseaseproof.com which shows percentage of calories from unrefined plant foods and percentage of deaths from heart disease and cancer for the countries Hungary, USA, Belgium, Sweden, Finland, Portugal, Venezuela, Greece, Mexico, “Korea”, Thailand and Laos.. It appears to show that as plant food consumption increases, the risk of dying from heart disease and cancer decreases. Korea, Dem. Rep. 69 ..
I’ve also included both Koreas, as the original graph-designer somehow, astonishingly, neglected to specify which one they meant. Is it the famously secretive, dictatorial North Korea, with a life expectancy of 69 and not enough data for the World Bank to estimate their GDP? (though Wikipedia handily estimates it at $2.4k per capita). Or is it the democratic, high-standard-of-living South Korea, where you can expect to live to the ripe old age of 81? 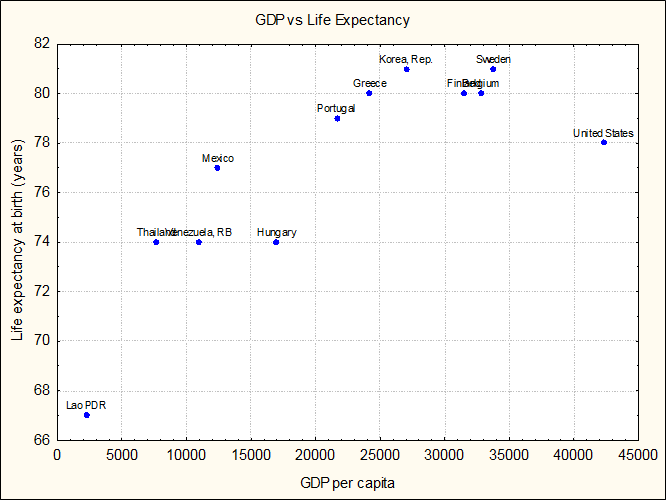 Graph showing life expectancy and GDP for the same countries as the previous graph, Hungary, USA, Belgium, Sweden, Finland, Portugal, Venezuela, Greece, Mexico, Korea (South and North), Thailand and Lao. 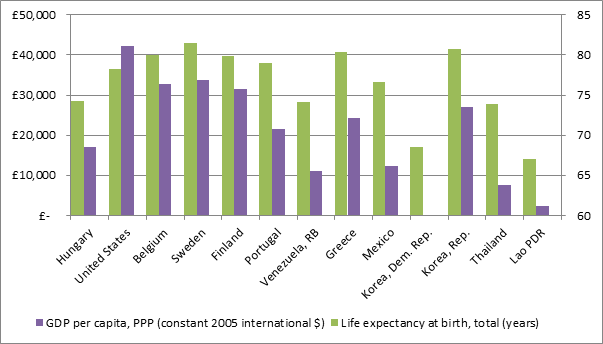 There is generally a higher GDP and life expectancy for the countries on the left, but no strong trend. Not the most conclusive graph in the world, but then I would say the same for the original, and sadly I’m sure there are many people who took it at face value. I took a couple of quick averages, splitting the countries into left-of-Greece (where we eat too little unrefined plant foods and die of heart disease and cancer) and right-of-Greece (where we eat nothing but vegetables and nobody gets cancer!). (I excluded both Koreas from this). So the question becomes – would you rather die of heart disease at 78, or of something else (starvation, diarrhoea, pneumonia) at 73? But the thing that most grates about this graph is the apparently random selection of countries. If you have enough data points (e.g. countries) then you can select the ones you want to make a relationship look like it exists where it doesn’t. So I undertook a similar exercise, and downloaded data for all 220 countries available from the World Bank on forested area (as a percentage of total land area) and risk of maternal death (% over a lifetime). And behold, I have found a terrible relationship! We must plant trees in order to save the poor mothers! 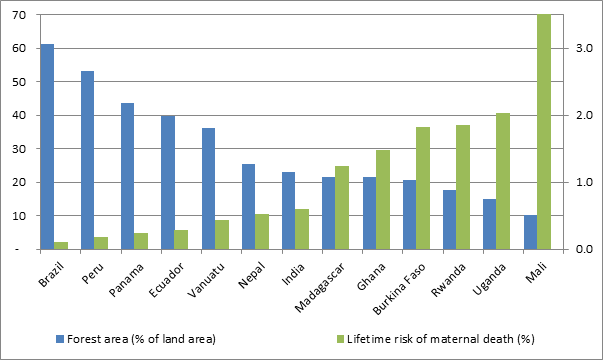 Graph of forested area as a percentage of total land area and likelihood of maternal death for the countries Brazil, Peru, Panama, Ecuador, Vanuatu, Nepal, India, Madagascar, Ghana, Burkina Faso, Rwanda, Uganda and Mali. The trends appear to show that as forested area decreases, the risk of maternal death increases. (I’d like to say that I didn’t spend a lot of time on this graph, but that would be a lie. It’s actually quite engrossing seeing what you can do once you decide your intention is to abuse the data). Scatterplot of GDP vs life expectancy for Hungary, USA, Belgium, Sweden, Finland, Portugal, Venezuela, Greece, Mexico, Thailand and Lao. In my original comment on facebook, I used GDP per capita, constant 2000 US$. I’ve changed this for PPP – Purchasing Power Parity, where the dollar amount of GDP is adjusted to reflect how much it actually costs to afford certain products in that particular country. For example, I argued at an Oxfam meeting last year that income should only be used as an measurement of a broader dimension “livelihoods”, rather than be a dimension itself, and will hopefully be using that in the framework for my PhD. This entry was posted in Poverty and tagged data, research, science by Maeve. Bookmark the permalink. Oh Maeve thank-you for pursuing this. Its such a pet hate of mine, misrepresentation of data, it gives my profession a bad name. I agree with all of your points. Just a few additional things to think about. When you have two variables which you think are related, rather than plotting pairs of bars for each individual (country in this case). Its best to plot the pairs of data points as a scatterplot, you can label each point to identify the country. There are a couple of reasons why this is better. Firstly, when you do a bar chart the order of the countries can have a huge influence on how the relationship looks, the scatterplot is not order dependent. Secondly there may not be a linear relationship between the two variables and the scatterplot may help identify whether this is the case. I will send you the graph, perhaps you could add it to my comments as I cann’t seem to do this within this “reply” box. Oh another thought, this kind of levelling off is often seen when there is a limiting factor to the response variable. A kind of diminishing returns, you have a biological limit on how old humans can get, you cannot get any older than this limit no matter how much money you have. So after a certain amount of money which does help increase you lifespan extra money adds less and less until there is no benefit at all. I can’t work out how to make the graph display in comments (it’s there in the source code but still not showing up) so I’ve edited the original post. Great analysis. I especially like how you compared the flawed graph to the graph of risk of maternal death and forest area. As you say, it is unfortunate that some would take this sort of disinformation at face value.